May is Asian Heritage Month and Kapisanan Philippine Centre for Arts and Culture wants to take you to Manila -- without leaving Toronto. 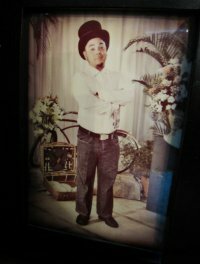 Celdran’s artistic brand of nation building through his performative historical tour of Manila is something that would be very relevant to not only the broader audience looking for a new cultural experience, but also young Filipino-Canadians searching for their roots and Filipino immigrants yearning for familiar story from home. 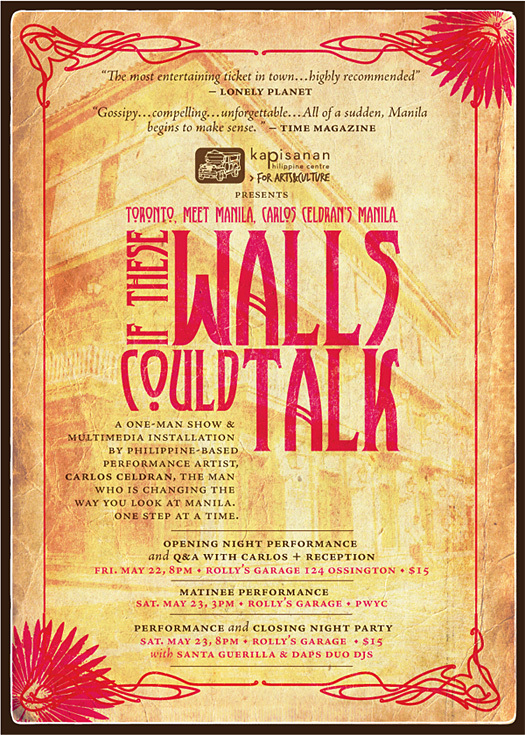 A multi-disciplinary artist, trained the University of the Philippines and later on at Rhode Island School of Design, Celdran has exhibited his works in his home country and abroad, and has served as the artistic director of Walang Pamagat (meaning No Title in Tagalog), the first experimental theatre company in the Philippines for 6 years in the 1990s. Walang Pamagat created new visual art forms that brought together sculpture, dance, theatre, and music, taking in all the varied aspects of Philippine aesthetics as an inspiration. 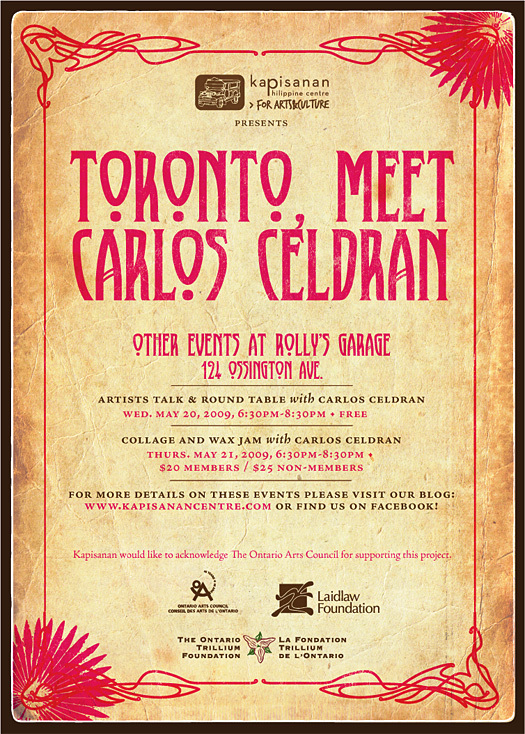 Carlos will also be collaborating with some of the young Filipino-Canadian artists within the Kapisanan community, including April Aliermo, Jeff Garcia & Jan Avedano of Halo Halo Collective!